This once-in-a-lifetime event will see the RAF's principal bands and the Salon Orchestra visit 11 prestigious venues around the UK, starting in Poole on 23rd September and ending in Manchester on 31st October. Classic military tunes including The Dambusters March and Spitfire Fugue will share the programme alongside the fantastic big band sound of Glenn Miller's In the Mood and Keep 'em Flying. 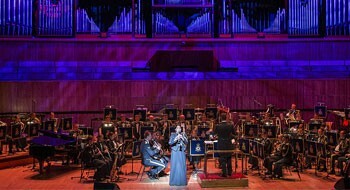 Tour organiser Tina Outlaw said: "The Concert Tour is a fitting finale for a wonderful year of celebrations marking the centenary of the Royal Air Force. RAF 100's mission has been to Commemorate, Celebrate and Inspire and what better way to do it than through music spanning the past 10 decades". The concert tour will visit: Lighthouse, Poole; 23 September: Bristol Cathedral, Bristol; 25 September: Symphony Hall, Birmingham; 26 September: Theatre Royal, Norwich; 29 September: Royal Concert Hall, Glasgow; 3 October: Sage Gateshead, Gateshead; 4 October: Wales Millennium Centre, Cardiff; 19 October: Waterfront, Belfast; 23 October: Royal Concert Hall, Nottingham; 27 October: Marlowe Theatre, Canterbury; 28 October: Bridgewater Hall, Manchester; 31 October. "The concert was excellent. A wonderful evening of great music, expertly played. My wife and I go to many musical concerts during the year and the highlight of them all is undoubtedly the RAF in Concert". - Mr SD, 2017 audience member.